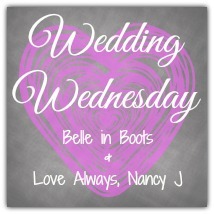 Wedding Wednesday is back! Today, I’m sharing some pre-ceremony shots. This is a bit picture heavy, because how else can I talk about fun stuff like weddings without lots of pictures? Per usual, I’m linking up with Jordon, Meredith and Mary and hope you’ll check out their blogs. On the morning of the wedding, Kim and I got our hair done at a studio right across from Hollow Creek (our venue). Once we finished our hair, we got breakfast and then hung out with the rest of the bridal party. We had a light lunch at 12pm and then at 2pm, Kim, Alana, Mom and I went back across the street to get our makeup done. Once we were all finished with hair and makeup, we headed back across the street to Hollow Creek, where all my girls were getting ready. We toasted with champs, listened to music and I started to get into my dress. Such a beautiful day! Come back next week, where I’ll share some pictures from our first look — and talk about why I highly recommend doing a first look! What did you do pre-ceremony? Were you stressed? I was so calm! Wow if things look this beautiful for pre-ceremony, I can’t wait to see the ceremony pictures! What a lovely and fun time! thank you — it was such a great time! You look so beautiful! Sounds like a great morning and how nice that your hair/make-up were across the street! So convenient! Mary recently posted…Wedding Wednesday: I was (flash) mobbed! yeah, the best feeling is just knowing that you’ve done everything you can and it’s gonna be great 🙂 and thank you! Pre-ceremony pics are so much fun!!!! Rebecca Jo recently posted…Do you like you? Such a beautiful bride! These pics are incredible. You had such a great photographer documenting your day! Getting ready was one of my favorite parts. I had done a hair trial with the resort stylist the day before and yeah…she was pretty terrible. So I went back to her to have my hair curled but then pretty much ended up doing it myself. (And then it all fell to pieces anyway because it was so humid.) Then into my dress and hung out with the girls in the hotel room listening to music, dancing, and drinking lots of champagne! It was a blast! Lauren recently posted…Sometimes it’s the little things…. Gorgeous pictures! I love your hair in the back. I love all of your photos – you looked absolutely gorgeous! Before our wedding, I spent a relaxing morning at the salon with my bridesmaids and my mom, and then we went to my parents’ house where we all got ready. I was nervous when I put my dress on, and then really nervous when there was a bit of commotion due to our party bus getting into a car accident on its way to come get all of us. Btw, I’ve nominated you for the Very Inspiring Blogger Award. Be sure to check out my post! Great photos! I look forward to seeing the ceremony pics. You are a gorgeous bride! I love how you did your hair and your dress is stunning! Emily recently posted…BEDA: Day 11&12: Movies and Guilty Pleasures! Sooooooo freaking beautiful you are!!! I’m loving all of your gorgeous pictures! Your smile is MAGIC in that photo in your dress. Looks like a beautiful day and love all the hair-dos on your girls. I LOVE all the getting ready photos for a wedding. So pretty!